It’s time for a modern, functional and user friendly website for your dental practice! Having a well-designed, functional and user-friendly website is very important to running a successful dental practice in today’s modern world. This will be achieved for your dental practice through Website Design and Website Development. We will work with you to create a new custom website or renovate your current website, by determining a design and functionality that best suits your dental practice’s needs. A professional modern design and a smooth backend configuration will allow current and potential dental patients to easily navigate your site and learn more about what your dental practice has to offer. Website Development refers to the internal structuring of the website, which ensures that your dental practices website is running properly. 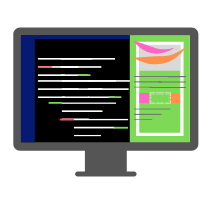 The internal structure of your website has many parts; formatting of content, sizing of images, plug-ins, HTML, H1 Tags, schema, site speed, the overall organization of your website, and so much more. Having a properly formatted back-end of your website will create a better user experience for current and future clients. The development of your dental practice’s website is important for the function, site speed and how user-friendly it is for patients. If your website is slow or not user-friendly, it is likely that clients will not last long on your pages, resulting in a loss of new clients for your dental practice. Plug-Ins are a great tool to add extra aspects to your website. We will use plug-ins that are going to add to your users’ experience based on your practice’s individual goals for your website. Plug-ins can allow us to monitor your sites statistics, scan for any security risks, and include extras such as, contact forms and email subscriptions. We will also make sure that the site speed is always running at an optimal speed, creating a quick and pleasant experience for potential and current dental patients. 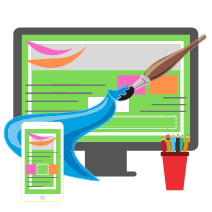 Website Design refers to all of the visual aspects of the website that users interact with. This includes; content, images, page formatting, colours, branding, navigation, menus, contact information, social media profiles, reviews, etc. It is incredibly important to have a well-designed and laid out website for your dental practice. Users will be able to find the information they are looking for and have a good understanding of your dental practice and what you offer. One of the main aspects of web design is establishing a consistent brand that will be used throughout all pages of your website. Your website is the hub of your brand as this is the place where potential patients will be able to fully understand your dental practice. When designing your brand, and your website, it is important to make sure that the end product is something that is visually appealing. High-quality visuals and user-friendly design will add to the professional feel of your dental practice’s website and your brand. Creating this professional appearance online lends credibility to the professionalism of your dental practice. The navigation of your website is another big aspect of having a quality website. This refers to how easy it is to use your dental practice’s website and find relevant information. A functional website will feel intuitive to use because information will be easy to find and understand. By ensuring that the experience potential and current patients will have while on your website is positive, this will help to form a good relationship between your patients and your dental practice. We will create what your practice needs! We will work with your practice to either renovate your current WordPress website or create a new WordPress website from scratch that is custom to your dental practice’s brand and goals. Using WordPress ensures that your website will be optimized for both desktop and mobile users. Creating a modern and well-functioning website will provide your users with good experiences and lead to your dental practice becoming more successful. Creating a good website will help to increase your search ranking, as better user experiences lead to Google and other search engines to regard your website as trustworthy and will increase your standing. Having a professionally designed and developed website adds to the professionalism of your brand, which is important to any business’ online presence. Having a professional website will help to create better bonds with your clients, leading to increased revenue and new clients. For more information on our Website Design and Development services for dental practices, fill out our form below or send us an email.